Having released a solo-acoustic album, Michael felt that it was time to get back to the fuller production he'd been used to. 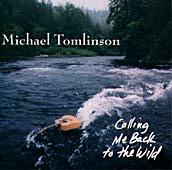 He once again united with his good friend, Daniel Deardorff, and together they produced Calling Me Back to the Wild. The songs had been written over a two year period of traveling and performing. It is a very personal album, with much of Michael's private life flowing into the songs, particularly in the haunting ballad, All Love For Good, which is about the life and passing of his sister, Marilyn. His upbeat version of So Alive was named by a Florida radio station, "Favorite Song of the Year."